Phase one of campus renovations began over this summer, bringing big changes particularly to Aquinas Hall in the schools of business and nursing. The School of Business moved from the second floor into a recently-renovated Aquinas 100 (previously the Curtin Memorial Library) and has been in use since the start of the Fall 2018 semester. The space provides the school of business with an enhanced working and learning space. Phase one also included the addition of five new offices on the floor. Phase two will create additional spaces for seminars, an analytics lab, and a 2,000 square foot atrium. A further renovation included in Phase two will be a five-stop elevator to service Aquinas 100 and Aquinas Hall. The School of Nursing moved all of its office space to the second floor of Aquinas, previously the business area. 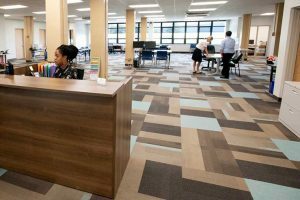 This new space features additional offices for faculty, open workspaces for students and a new office for the recently appointed Dean of Nursing, Susan LaRocco. These renovations were made possible by two matching grants that were issued to the college. The first was for $500,000 and from the state Higher Education Capital Matching Grant program (HECap). The second was also for $500,000 and from Empire State Development. Other changes on campus entailed the resurfacing of Kaplan Hall’s gym floor, updated signage across campus, repaved or seal coated roads and lots, new flooring in Residence Life and Students Activities offices, the replacing of light fixtures and the movement towards more energy-saving initiatives.